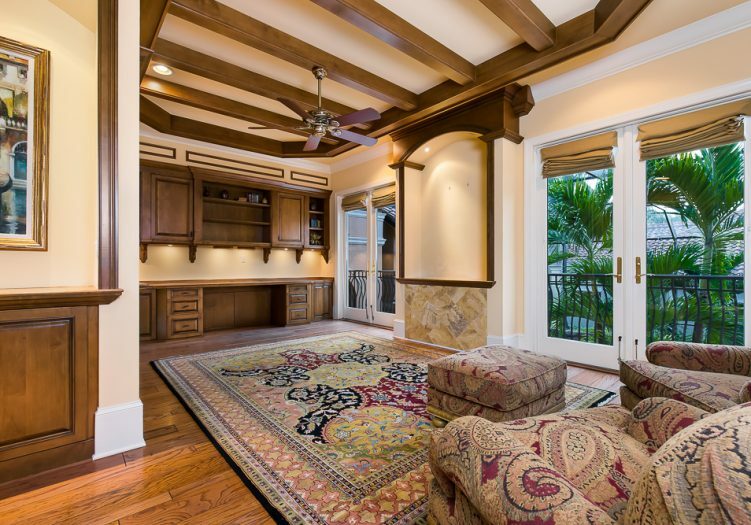 Magnificent two story villa is complete with a poolside guest cabana in the screened lanai courtyard and long sparkling lake views as the perfect tropical backdrop. 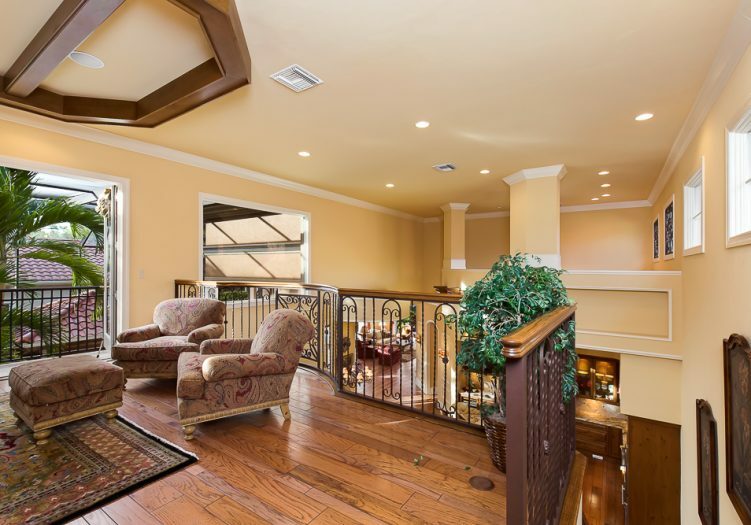 As you step into the foyer you are instantly captivated by the outstanding views flooding into the elegant formal living room through the oversized glass sliding doors flowing into the tasteful formal dining room. 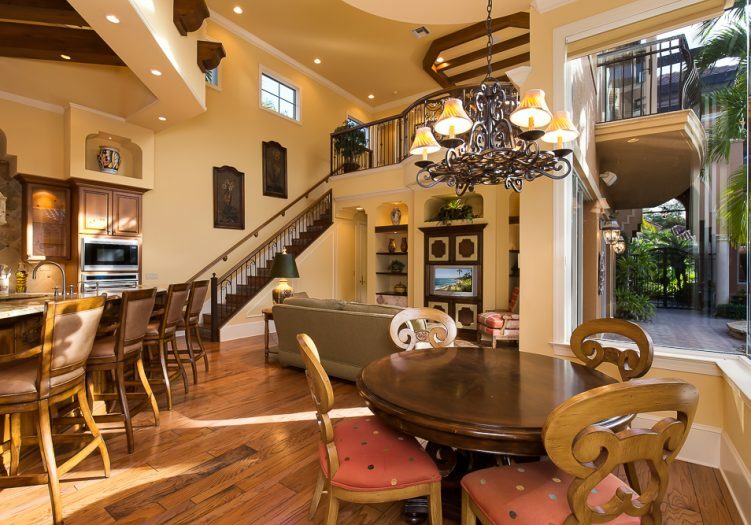 You will be struck by stunning appointments found throughout including volume ceilings highlighted by exposed wood beam and applied molding detail, wide crown moldings, extensive windows, majestic columns, integrated interior and exterior sound system, architectural niches with built in display shelving and rich wood flooring in the main living spaces. 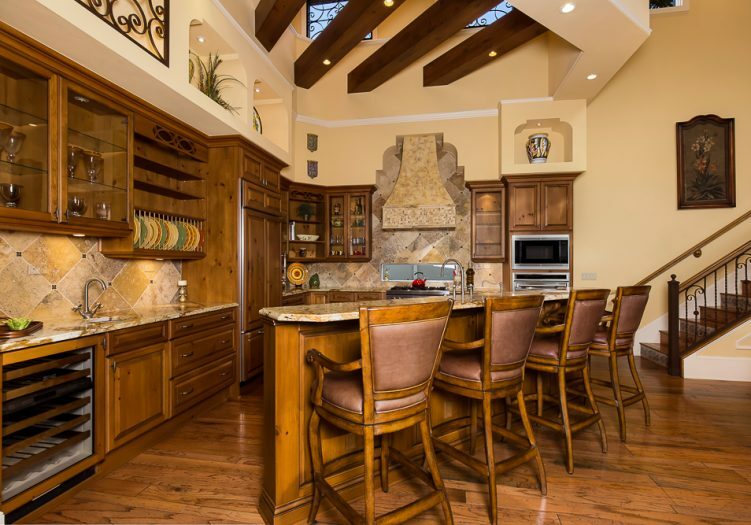 Wood beam detail highlights the ceiling in the gourmet kitchen featuring top of the line built in appliances, an ornate hood above the six-burner cooktop, under counter wine cooler, reverse osmosis water system, custom stone backsplashes and an abundance of decorative storage cabinetry. 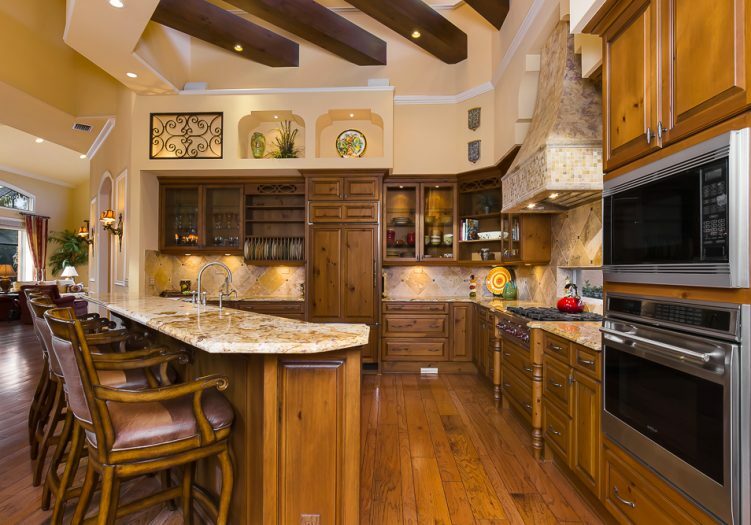 Gorgeous granite tops the work surfaces including the wet bar service area and the extensive breakfast bar overlooking the breakfast nook. 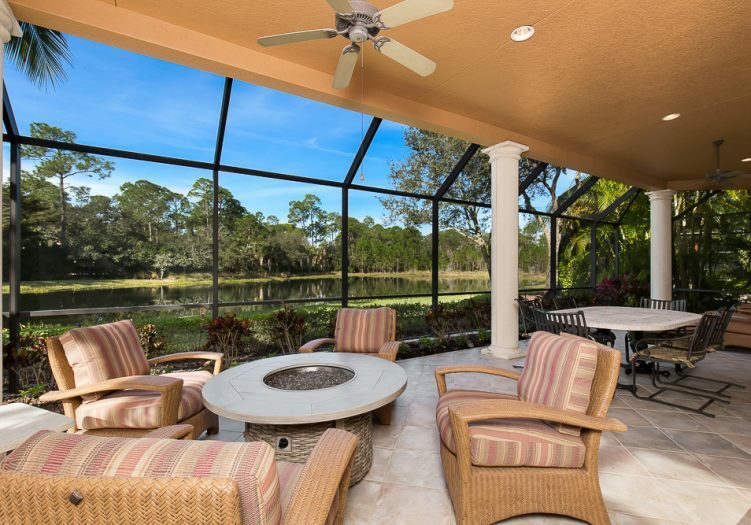 The kitchen also overlooks the family room featuring large glass sliders opening to the screened pool courtyard with close proximity to the covered summer kitchen creating a seamless transition from indoor to outdoor casual living and entertaining. 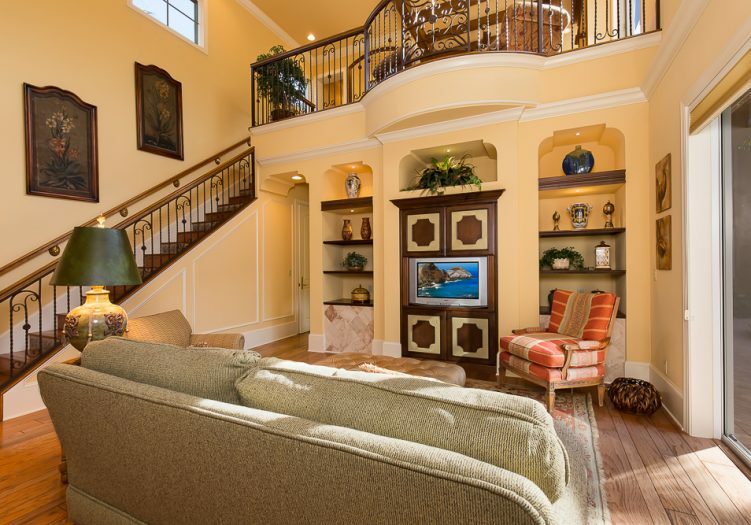 Ascend the iron railed stairway in the family room to the open loft living area with built in storage cabinetry, a desk work station and two sets of French doors opening to the sunlit terrace overlooking the pool and spa in the courtyard below. The second story guest suite is complete with access to the private open air lounging balcony. 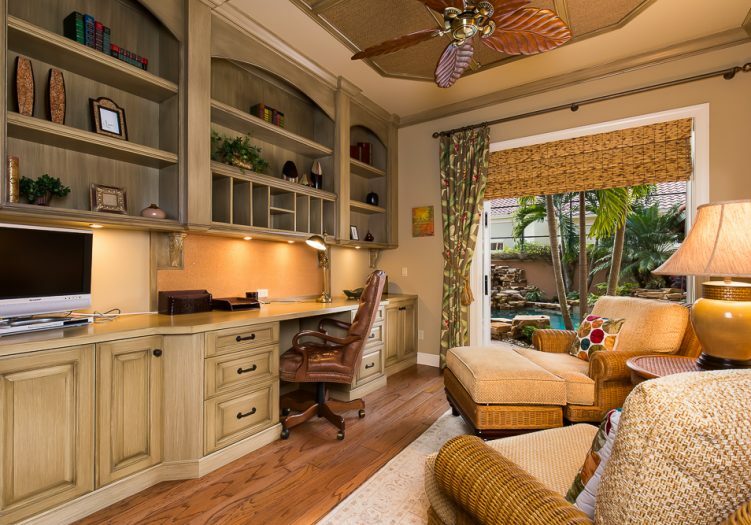 Handsome flooring accentuates the wood built-ins that create display shelving, storage cabinetry and an impressive desk work station in the den. 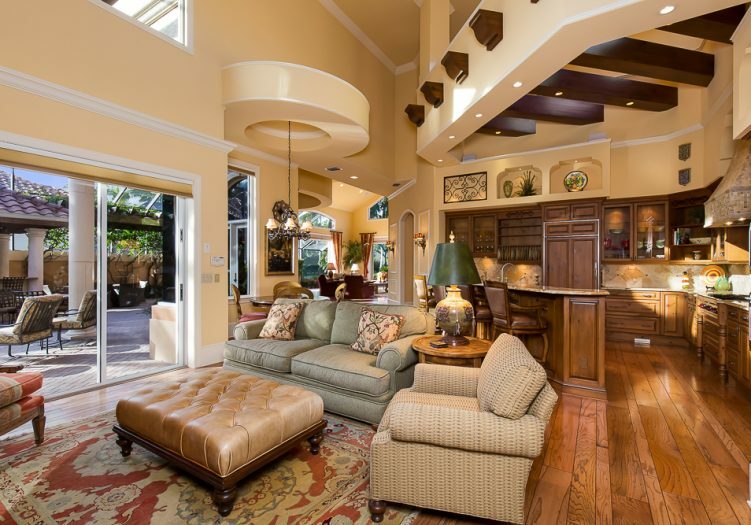 This impressive den also has a glass slider that opens to the pool courtyard. 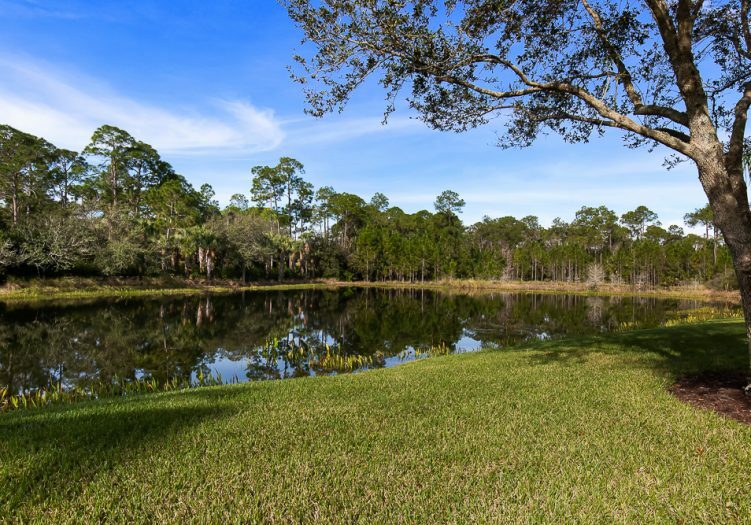 Retreat to the master bedroom suite with tranquil lake views coming through the oversized glass sliding doors opening to the secluded screened loggia and a large walk in closet with custom closet organizers. 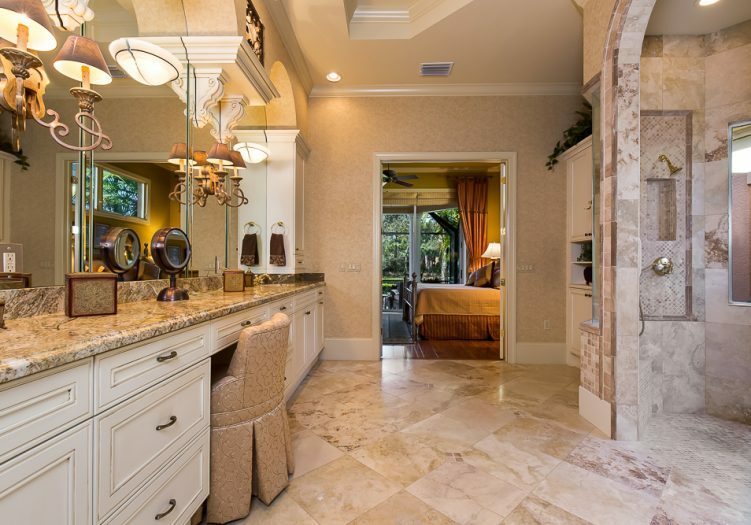 The spa inspired master bathroom features an extended vanity, including a lady of the house dressing table, custom mirrors, and gorgeous stone accents surrounding the open walk in shower with dual shower heads. 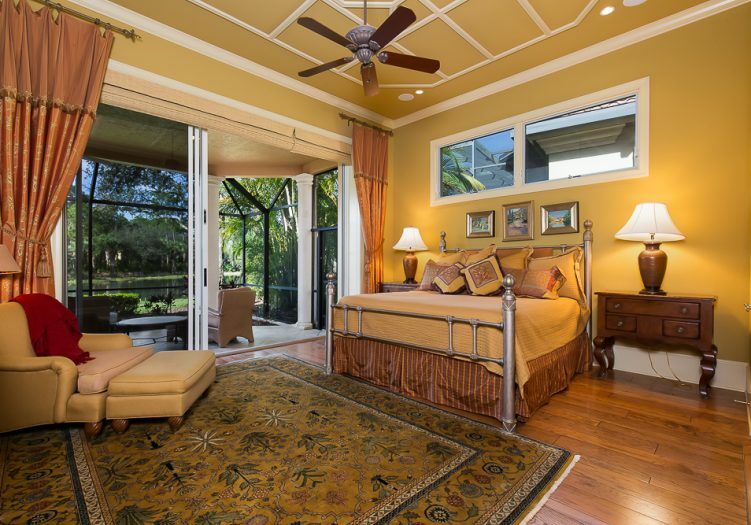 Sliding doors open to the private open air master suite garden and shower area. The poolside guest cabana is complete with two private guest suites, one upstairs and one downstairs. Each suite has outdoor access; the upper suite opens to a private elevated sunlit terrace overlooking the pool and spa below. 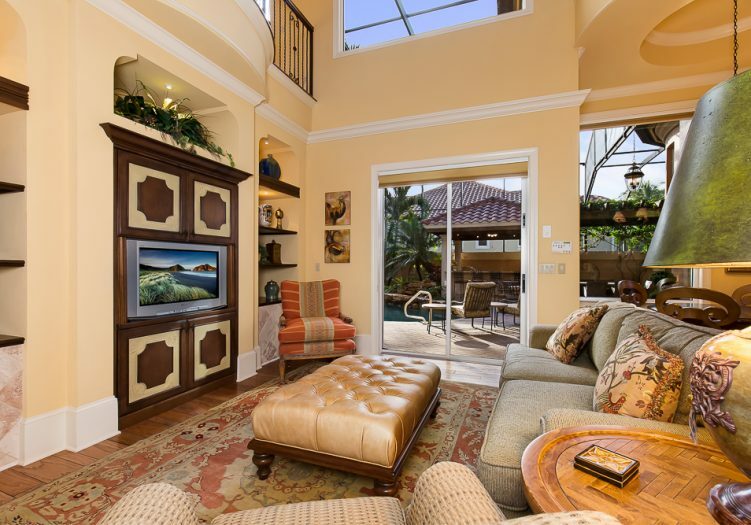 Enjoy lounging around the sparkling pool and spill over spa in the courtyard screened lanai featuring a serene rock waterfall feature and a full pool cabana bath. 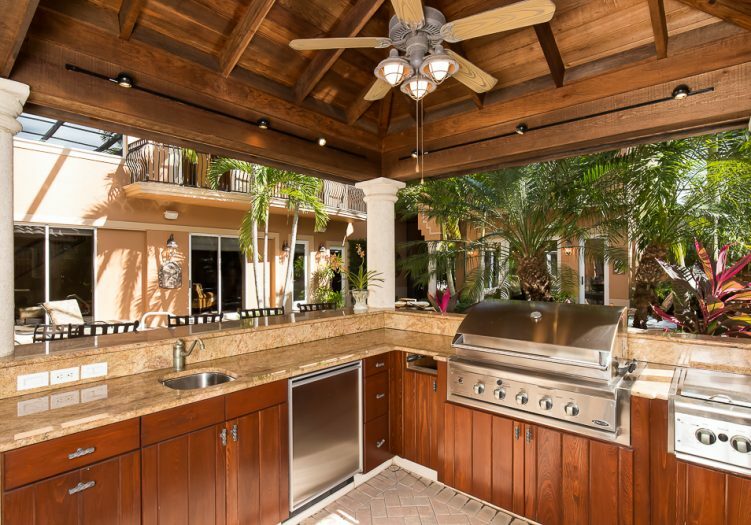 This professionally landscaped screened area also boasts a separate covered summer kitchen with granite countertops, a built in gas grill, two extra side burners, a deep sink and an under counter refrigerator with an ice maker. The extended ivy covered trellis creates an adjacent covered dining space. 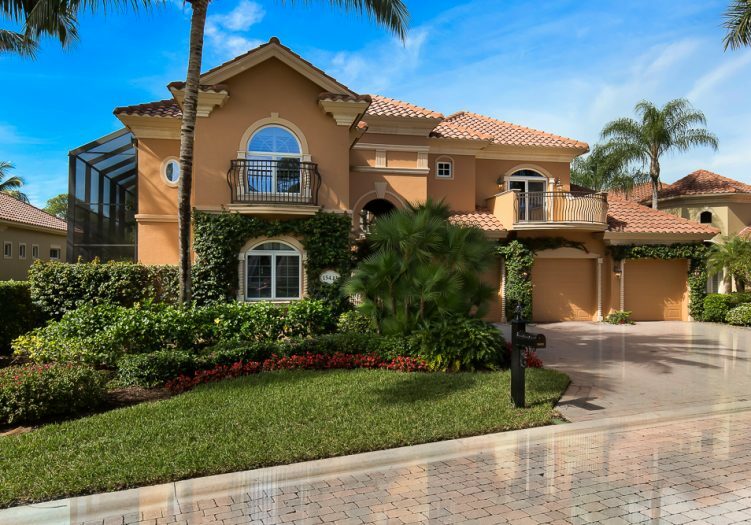 Long sparkling lake views with lush tropical preserves beyond create the perfect backdrop for this phenomenal two story villa residence.